“The U.S.-China trade war is on hold but that doesn’t mean tensions between the countries are easing. Two days of trade deliberations in Washington ended with both sides arguing all night over what to say in a joint statement… but without Beijing acceding to a demand to cut the U.S. bilateral trade deficit by $200 billion. The standoff left Treasury Secretary Steven Mnuchin declaring the Trump administration is ‘putting the trade war on hold,’ and won’t apply tariffs on Chinese imports while the countries seek to hammer out a deal. They are at an impasse over how detailed to get on the trade of specific goods” [Wall Street Journal]. If venture capitalist J.D. Vance, author of Hillbilly Elegy, had run for the Senate in Ohio, he would have run as a Republican. So that’s two reasons he’s ideal for Booker. “Hillary and Bill Clinton Go Separate Ways for 2018 Midterm Elections” [New York Times]. “[I]n the 2018 election campaign, Hillary and Bill Clinton have veered in sharply different directions. Mrs. Clinton appears determined to play at least a limited role in the midterms, bolstering longtime allies and raising money for Democrats in safely liberal areas. Her husband has been all but invisible. And both have been far less conspicuous than in past election cycles, but for different reasons: Mrs. Clinton faces distrust on the left, where she is seen as an avatar of the Democratic establishment, and raw enmity on the right. Mr. Clinton has been largely sidelined amid new scrutiny of his past misconduct with women. Mrs. Clinton is expected to break her virtual hiatus from the campaign trail this week, when she will endorse Gov. Andrew M. Cuomo of New York in a contested Democratic primary, her spokesman, Nick Merrill, confirmed.” Wait, wait. Last I checked, Cynthia Nixon is a woman. Isn’t there a special place in hell for women who don’t help out other women? “Clinton to be honored at Harvard for ‘transformative impact'” [The Hill]. Irony is not dead. UPDATE “Why does Trump get away with corruption? Because Bill and Hillary Clinton normalized it” [Josh Barro, Business Insider]. “Hayden: The Intel Community and Presidents — Facts vs. Vision” [RealClearPolitics]. Hayden on Presidential transitions and the intelligence community: “HAYDEN : We knew that if it were to be a President Trump this [transition] would be a big speed bump because these attributes I described over here, I think the creator gave him an extra measure. He is inherently instinctive, spontaneous, not very reflective, prone to action, has an almost preternatural view of his own preternatural confidence in his own a priori narrative of how things work. So we well, this one’s gonna be tough. To your point, it is a national tragedy and a perfect storm that the first time we had to do that with the new president, we knew it’s always tough but it was gonna be especially tough with this one, through no one’s fault, it was on an issue as you described. An issue that other Americans, not the intel guys, other Americans were using to challenge his legitimacy of President of the United States.” “Not the intel guys.” Really? “Reform vs. Revolution” can be a false dichotomy within the context of real Leftist conversation sometimes. The Jobs Guarantee might be such a reform, but the devil will be in the details. #MedicareForAll, too? UPDATE “‘ACORN and the Firestorm’: Uprooted” [People’s World]. Sure is odd the liberal Democrats didn’t spin up a new organization to replace ACORN’s voter registration function. UPDATE “Progress! States are finally replacing touchscreen voting machines — which provide no means for voters to know if their votes were recorded correctly — with new touchscreen ballot markers, which also provide no means for voters to know if their votes were recorded correctly … Wait what?” [Medium]. Nice Daily Mail-style headline! Chicago Fed National Activity Index, April 2018: “After slowing at the outset of the year, the national activity index — led by manufacturing and employment — is back at its expansion best” [Econoday]. 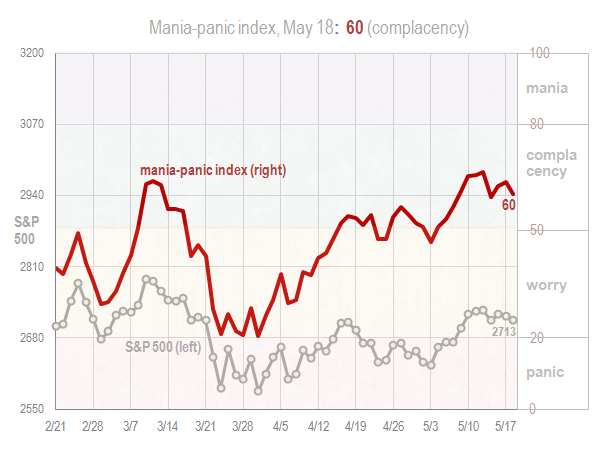 “This index still has a way to go before it begins signaling inflation risk…. Note that revisions, given lagging data, can be extreme in this report with only 51 of 85 indicators included so far [!!] for April’s initial reading.” And: “This suggests economic activity was above the historical trend in April (using the three-month average)” [Calculated Risk]. 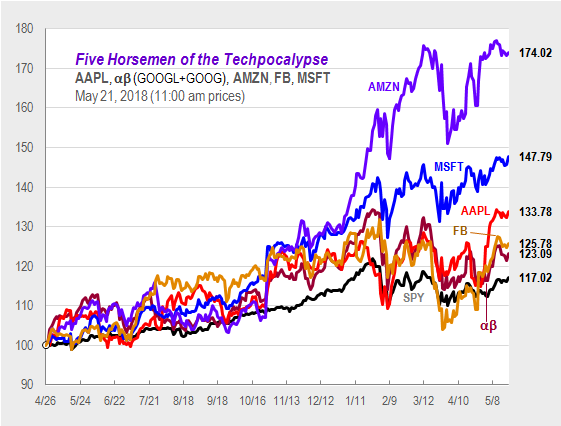 Five Horsemen: “Microsoft is just below a record high in late morning trade” [Hat Tip, Jim Haygood]. Rapture Index: Closes down on wild weather. “The lack of activity has downgraded this category” [Rapture Ready]. Record High, October 10, 2016: 189. Current: 182. “In 2015, Niamh Geaney, a 28-year-old Irish woman, was approached by a TV production company to participate in an unusual competition: a race to find her twin stranger, a stranger who looks exactly like her. Within two weeks of scouring social networks and every other available outlet, she’d found a dead ringer, Karen Branigan, from Dublin. Then she found another match, Luisa Guizzardi, from Genoa. And then another, Irene Adams, from Sligo. Identical quadruplets by appearance, in reality they were unrelated” [Aeon]. This entry was posted in Guest Post, Water Cooler on May 21, 2018 by Lambert Strether. identical quadruplets, unrelated? So much for eyewitness testimony! Also facial recognition (especially in court). That’s it. The end of ‘armless robots. Robots from now on will form a army of ‘armfull robots. I’m not too sure that this was what Dr. Asimov originally had in mind. We have no business possessing bear arms, regardless of regulation. But do we have the right to arm bears? The only way to stop a bad bear (with or without a gun) is with a good bear with a gun. Re: Clinton endorsing Cuomo over a woman. I just figured that’s because the special place is better than the part of hell she’d go to otherwise. Glenn Greenwald (@ggreenwald) commented on this on Twitter and has been getting lots of wickedly sarcastic comments re HRC, Madeleine Albright’s comment, and that special circle of hell. Not sure Cuomo is going to benefit from this endorsement. Cynthia is probably smart enough to turn Albright’s earlier comment into a TV advert. Honestly, I would love to see Cynthia Nixon go there. But as she herself was a Clinton supporter in 2016, I don’t think we’ll see the likes of it. She will probably reason that she needs those voters in the general. And much as it pains me to say it, that would be right. She can ill afford to make Clinton’s biggest mistake: alienating her primary opponent’s supporters. Well, HRC endorsed Cuomo over another woman, Zephyr Teachout, in the 2014 primary. So at least you can’t accuse her of waffling on this issue (i.e. the superiority of Cuomo to women as NY Democratic candidates). And I think this may earn her access to the Dante/Albright “special second circle of hell”. So that’s another win for her. Maybe she’s just keeping up with the ‘Status Cuomo’? Maybe her animus finds something in Cuomo’s anima worthy of endorsing. It’s pretty long, so get some coffee and settle in. I am looking forward to reading what appears to be a special, special work. Re: “Stopping Mueller to Save Us All” – using legal process, special prosecutors, etc. to prevent any anti-establishment candidate from running (and if they win, to make sure that they do not leave their box) is entirely intentional. What I want to know most of all about Mueller, is why does the ‘e’ remain silent, what’s he trying to hide? I wouldn’t want a name that sounds like mewler. Who would? Hey if Hillary hadn’t run would Trump be president? Very transformative. She’s the queen of Krazytown. Meanwhile the self-described feminist leader is married to someone keeping a low profile because of his reputation for sexual misbehavior. Irony indeed not dead. I would not be surprised if she wins a Nobel in literature. Except Nobels for literature are not being given out right now because of corruption scandal at Swedish Academy (including still more sexual misbehavior). I think she’s going to write about that, and win one for that effort. Maybe. She does make everything up as she goes along. Truth is flexible to her. She can live for extended periods within dreamworlds. Pretty good skills for a writer of fiction to have. Would there have been a potential for Sanders? Or would the lack of a celebrity such as HRC, who is basically a sitting President in profile, have delayed awareness of a primary to the last minute with doofuses such as Tim Kaine, Hillary’s hand picked successor, and Corey Booker running? How bad is the rot in the Democratic Party? Or the perception of the Democratic Party? The narrative of a secret liberal Hillary has existed, but would Timmy have been a beneficiary of said narrative or would he just be the co-chair of Lieberman 2004? On the GOP side, did the sense of Hillary inevitability drive Trump as the original none of the above candidate? The doofus nature of Jeb and the long standing issues with the 41/Romney wing of the party versus the Evangelical and movement conservatives probably shaped the desire for an outsider, but I imagine there was a sense of throwing votes at the most likely to throw rocks. I know you disagree but I think a lack of Hillary may have prompted Biden to run, and win, against Trump. Call it personality counter programming. Plus the male chauvinist factor is not to be underestimated even if Hillary is always whining about it. Not that we wouldn’t still be in Krazytown with this result. The Blob is forever. But perhaps only Hillary and her minions could cook up a Russiagate (with plenty of Obama minion help). Where does pq live? We’ve been having eighties and nineties, even a few hundreds in the urban heat sink centre of town this last few weeks. We being domiciled in southern Mississippi. The locals are saying that we skipped spring and went straight from winter to summer this year. The weather pattern the last weeks is summer like here. Has the jet stream dropped to the south for the foreseeable future? 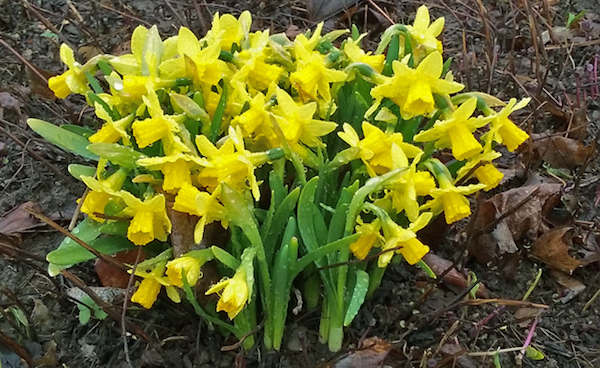 Our daffodils came out in late February to early March this year. Yet another indication of how large America is. Re. jet stream: flew Munich->Charlotte last Wednesday, like I’ve been doing about twice a year since 2011. Always make landfall at least by New England, if not Newfoundland, then down to NC just inside the east coast. This time, made landfall at the NC-VA border, heading due west. What great circle route ;>) ? Don’t know if it was the jet stream, but must have been somehow weather related. That’s possible. Avoiding jet stream headwinds when going East and ‘hitching’ a ride with jet stream winds when going West would seem to be logical for an aircraft to do. I got the directions above reversed. In the Northern Hemisphere, the jet streams generally run from West to East. So, to avoid headwinds means you’re going West. ‘Hitching a ride’ on a jet stream means you’re going East. Not to worry. I made the same mistake; originally wrote “made landfall … heading due east” but the edit link is my friend … when it works! It’s very quaint to hear talk of east, west, etc in describing the jet stream. Last five years have been very different. Is this of recent origin? Connected to the loss of high albedo snow cover? I have an inventory of plantidotes (good for me, but sometimes the timing is a bit off). All those Uber drivers Neil Mueller has been using these last six years should send him a thank-you note for shoving his automobile ownership expenses off on them. Snark aside, how about a class action suite against Uber for profit sharing based upon individual drivers’ “investment” in the scheme? I couldn’t finish reading that article. The snark was stinking it up. The benefits that this analysis arrives at only work when you treat two variables as fixed (cost of car ownership and cost of Uber). Uber’s pricing is dynamic—price goes up when demand exceeds supply, and this is outside the control of the rider. Annual cost of car depends on the actual car bought, as well as local factors (cost of parking, fuel, maintenance, etc. ), so car costs won’t be the same across all rider segments. Just because using Uber is cheaper than owning a car for the author doesn’t mean it will be true for every driver (or “actual mileage may vary”). And what about this quote: ” car ownership cost $11,783 per year”…maybe for Neal it does. I spent $22K to buy a car in 2006 that I’m still driving today. No way have I spent $144K on that car in the past 12 years…even including the sale price or with inflation adjustments. I’d say the cost of my car has been about half of Neal’s estimate. I don’t want to deny Neal his happiness, and I’m no car lover either, but that article was just icky. Yes exactly- uber is a ‘saving’ vs owing a car that devalues by 50k! And the same jerk thinks making ‘2x minimum wage’ for reading hacker news in the front seat of an uber pool is an act of genius. Judging by his blog, Neal owns expensive cars. He mentioned in his blog that he owned a BMW M3. That is a very expensive vehicle to maintain. It’s a high performance car that can easily cost thousands each year out of warranty. They are expensive and depreciate like mad. Between the very high maintenance costs, insurance, fuel, and the high depreciation, I could easily see it being ~$12000 a year.
. . . The joys of Uber and Turo are many (any ride you want when you need it). The toils of car ownership are many (parking, keeping it clean, you have to drive). With an M3, that should have been a joy. E30 or E36 maybe, later ones probably not. They have become ponderous and rather soulless to drive. Fast, but the car’s limits are so high that on the street one never comes close enough to the edge to have fun. And the self-destructing engines are such an absurdity. I don’t know what BMW means anymore, they’ve gotten so far from their roots. Indeed. I can’t even remember the last time they made an aeroplane engine. > And the self-destructing engines are such an absurdity. I don’t know what BMW means anymore, they’ve gotten so far from their roots. Neal Mueller was either smart or lucky to get rid of it when he did. He had the 2008 M3 with the V8 (E90, E92 or E93) They are not lasting very long. From the September 2016 Roundel and the great Mike Miller’s “Tech Talk”.
. . . the M3 forum has recently indicated that the V8 M3 is experiencing main-bearing failure at 80,000-120,000 miles . . .
. . . the bearing question is not new. It’s been going on for years and only in the M cars. There are two theories among technicians. (Neither is universal) The first theory says that it’s the result of a combination of poor maintenance in the form of overextended engine oil and filter exchange intervals changes, using the wrong oil, failure to wait for the oil to reach operating temperature before calling for high engine speeds, race track service demands, and a general hot-shoe driver profile. The title of the letter and response was “This Is Going To Sting a Bit”. The “Bit” part is a humorous understatement. BMW has lost their way. They now cater to people who consider driving a toil. What’s the next level beyond a ‘Flawed Democracy” for U.S.? And can we expect Mongolian exchange students to show up en masse, now that we are aligned with them in terms of equivalence? I would definitely enjoy studying eagle hunting as an exchange student to Mongolia. Mouth singing for me. Imagine being a human didgeriedoo. I’ve always thought it was Tuva throat singing. I’ll have to hunt up that PBS program about Feynmans quest for Tannu Tuva to find out. Throat singing it is. Both Tuvan and Mongolian. With music videos no less! With sounds like this, I’m surprised some of the more adventurous hip hops haven’t picked up on this. It would really add some ‘funk’ to modern ‘urban’ music. H—, music in general. Now this lady, Anna-Maria Hefele takes it to the stratosphere with her polyphonic overtone singing: Two simultaneous tones, dancing around each other! Brave must be the falconer who hunts wolves with eagles. I think he is correct in his usage (of depreciation as an expense). Using the depreciation on an $80,000 BMW sorta stacks the deck, though. Not sure why depreciation isn’t effectively an expense for this discussion, despite all the undoubtedly bright people you know? Otherwise, I agree with you. He (30 something single) had two cars, one was overkill (M3) and the other (Jeep) was either a toy for his beach safaris (Wrangler) or his commuter (Grand Cherokee?) and the M3 was the toy. Anyway, he can’t count that stable as “normal auto expenses”. I would like to see many, many more cars removed from the road, but Uber is a scam way to do it. Workers are now officially road kill. The vultures won’t have to mind their table manners. Thanks for the LaborNotes link ‘slim! I’m a full-time troublemaker and shop steward and absolutely LOVE LaborNotes. I’m not sure my local union feels the same way, but the only way to change that is to hit the bricks and keep organizing. The last of the ISIS fighters were bussed out of Yarmouk today. Damascus is now officially jihadi free. Next up will probably be the big blob around Daraa. A question for the crowd. Bernie Sanders just sent out an e-mail saying that he is running for re-election to the U. S. Senate from Vermont. Embedded is an appeal for contributions, something like his crowdsourced Presidential run in ’16. Now that I’m getting some Social Security, I can afford a few coppers for worthy causes. However, this funding mechanism is being run by ActBlue. I remember there being some questions about the “truth, justice and the American Way” as ActBlue does it. ActBlue is reliable, or not? They are asking for all my basic information: name, address, e-mail address, telephone number. I hate being on databases if I can avoid it. Maybe I’ll just finesse the issue and send a tenner to Lambert. That’s what I did. I sent a check-y-poo to Lambert. Just ask him for his address. He’ll be happy to accept your check. Some of that personal info is necessary because it’s a campaign contribution and FEC filings must list contributors by name, address, occupation, and amount. That said, I share the distrust and disgust with ActBlue. How did the Sanders campaign raise and co-ordinate all those $27 doses of money? Did they save that money-raising structure? Can they revive it? Or were they using ActBlue or such things because that’s all there is anyway? Most if not all of the candidates are using ActBlue, so I’ve been making donations with them for the last two years with no problem. You don’t have to let them save your card info. I would send a check in the mail. I made the mistake of contributing to Sanders’ presidential campaign through Act Blue, and now get funding requests from all kids of “blue” candidates I have no desire to support, even though I closed my “account”. It is clear that they got my information from Act Blue and not the actual Sanders campaign, too. Not necessarily. If one of the candidates you donated to is a card-carrying DNC/DCCC pick, they’re more likely to have sold off your info than ActBlue. I’ve made numerous donations via ActBlue, and the only email I get is from the campaigns of the candidates I supported. The DCCC and DSCC, on the other hand, I finally had to list as spam in Gmail in one instance before I could get unsubscribed. The other hand (yes, they found me somehow) I literally had to threaten them with legal action after numerous attempts to unsubscribe were ignored. It costs a-buck-and-a-half for a small money order. Put a bogus name, address, etc. on the info. Trust me, he will cash the check, and you will never be annoyed by Act Blue or anybody else. And on the receiving end of a postal money order, the recipient can go to any post office and get cash for it, no questions asked. Bernie will be watched and I hope/assume his people know that. Agreed, dcblogger. Violating campaign finance law is not the way to help Sanders! Deaths from walking has been a persistent problem ever since sprawl became the dominant pattern of development. Pedestrian-friendly mixed-use (stores / offices among the residences) cuts vehicle miles traveled roughly in half. … and it’s healthier if walking is part of daily life. With mixed-income neighborhoods (apartments among the mansions), this can even alleviate affordable housing problems, without diminishing marketability. Meanwhile, the good news: California State law now mandates roads built for new development be “Complete Streets” (i.e. accommodate something other than just cars). One organization to thank: the Planning & Conservation League. I thought we learned last week that it was SUVs that were responsible for the rising death toll. Isn’t the answer as simple as people constantly looking @ their ball & chain in the guise of an electric tether and not paying attention to anything else, as to the reason for the uptick in pedestrian deaths? Multiple causation is a thing, mkay? Though IIRC there’s overlap in these cases; SUVs are higher off the ground, so they strike pedestrians higher on the bodies, that is more lethally. I suspect that I’ve been racking up “Troll Points” like mad recently, but, a big thank you to all who responded to my ‘Toothache’ query yesterday. Not only did I get a ton and a half of needed moral support, but some good practical advice as well. Yes, it still hurts, but only when I laugh, as the saying goes. Trust you to get to the ‘root’ of the problem. High quality punsmanship too. None of this ‘pulp’ humour. The U.S. is the world’s top producer of both petroleum and natural gas. Oil production has almost doubled over the past decade and natural gas has had major increases as well. It’s a good thing that we’ve encouraged the exports of this stuff or else all we’d have for the damage to the environment is cheap gasoline. I would have hoped that one positive of the increased production in the US would be a lesser need to favor Middle Eastern dictatorships, but that hasn’t happened. The Obama excuse that we needed to increase natural-gas production for “energy independence” was one of his earliest scams. The NG for which people are being poisoned and experiencing increased levels of earthquake activity in places that hadn’t seen earthquakes for centuries, if ever, was always intended for export. Why else plans for all those pipelines to the coasts and processing plants for them to service? But, hey, if people near those fracking wells run out of heating fuel, maybe they can just turn on their faucets and light them up. And isn’t it convenient that NG was in the first round of sanctions against Russia, followed quickly by negotiations to replace it with gas imported from the US to Europe? Will we see the day when rare earths are priced and traded in Chinese Yuan? Once all the American oil and NatGas is gone gone gone, the foreign deposits of “easy” oil and NatGas will become more important than ever. Texas Gov. Greg Abbott promised “swift” action following last week’s school shooting and he’s already taking strong measures. He has scrapped plans to give away a “Texas-made shotgun“ after a gunman used a shotgun in a Friday rampage that left 10 dead in a high school near Houston. Instead he will give a $250 gift certificate. So bleeding hearts (and lungs and livers and extremities and ….) can’t say he hasn’t done anything to reduce gun violence; that’s one less shotgun in Texas. The only thing that stops a bad governor with a shotgun, is a good giveaway with a gift certificate? “Hillary Clinton today accepting full responsibility for the election loss, except for the part where she blamed Comey, Putin, Wikileaks, misogyny, and the media.” No ellipsis, and barely a pause at the first comma. So even CNN gets it right twice a…year? But seriously…that article has a lot of praise for “hand-marked” ballots that are not hand-counted (OCR, Optical Character Recognition machines, do the counting). 1) Do we accept the premise of this article, that this is significantly better than the “no paper trail” screen systems? 2) How much worse is this system than manual counting in terms of election integrity? I can certainly accept that a human-readable paper trail is better than not, as this always permits manual recounts (if the paper trail is kept–Florida destroyed the paper ballots after a public records request for them in a 2016 election. But if the machines do the counting, then they either have to have some way to communicate these results to a central repository (e.g. modem or wireless connection which is subject to “hacking”), or some person or persons has to do it manually, from multiple machines at multiple sites. So hand-vote/hand-counted > hand-vote/machine-counted > electronic jiggery-pokery? Or is this just bait-and-switch, like pretending to be for #MedicareForAll while actually being for “eventually, maybe, for most, and never ever single payer #ProfitsforAllInsuranceCompanies”? And what about electronic ballot images? Some people see them as a solution (with a nice Stalin quote “Those who cast the votes decide nothing. Those who count the votes decide everything.”), but they still seem hackable, at least to me. Without the actual paper ballots for comparison, and a regular comparison mechanism, how can you verify that the electronic images have not been modified? I’ll never get the logic behind NOT counting hand marked paper ballots by hand in public. Is it really that important to have the count completed within an hour or two of the polls closing? Are their any real labor cost savings with all of these expensive high tech voting machines that require maintenance and periodic replacement? How much can a couple of extra poll workers really cost? Absolutely. What would happen to the credibility of the MSM if they couldn’t “call” elections the very same evening, often within a minute of the polls closing? If elections didn’t exist, the MSM would have to invent them. Is it really that important to have the count completed within an hour or two of the polls closing? Huey, you seem to have forgotten about W’s adventures with chad in (IIRC) Florida. Took weeks to get a (the right) result. Chris, that’s an outlier case that’s nearly two decades old, not to mention those ballot errors were caused by voting machines. Keep it super simple and don’t let them pile the @#*^ too high to obfuscate matters. Paper ballots, counted in public. When the election is a big complex multi-office and multi-question election, people would have to accept that hand-counting would take a long time. I think that greatly depends on how many people you employ to do it, or not? It seems to me that the more workers, the quicker we get through each item on the ballot, the quicker we get through ballots period, regardless of how complex they are. There’s no real reason it couldn’t be done fairly quickly. Or am I missing something? How do other countries do it? In Canada’s federal elections we still fill in and hand count in public (scrutineers) paper ballots. Have plenty of polling places, plenty of poll workers, training beforehand for all temporary employees, and prompt payment of workers. fair elections, employment at a decent wage, and not huge time lags because of the number of workers. Elections Canada prefers to pay workers than to allow billion-dollar campaigns. Stephen Harper tried hard to mess up the system but largely failed. The big complex multi-office multi-question election almost looks like a clever scheme to geld real democracy, by giving the people their right to vote, and giving it to them good and hard. If it’s important to democracy for the count to be completed the night of the election (and it might be, I don’t know), then the sheer size of ballots is a problem for democracy. Make the paper ballots one issue each per piece of paper, inserted into one box per issue, to be counted in parallel by as many tables of people in a hall as you feel like hiring on the night. If you don’t think you can afford the tables or the hall space, hold off the less important counts for a day and count in series, using the halls, tables (and counters) you hired for the important counts for another day. If democracy can’t afford that, maybe quit electing so many offices, and make more of them appointments by the oficers we do elect. Nobody elects the Secretary of State, they elect the President, and let the President appoint the Secretary of State. You can’t. As soon as bits get involved then there is the possibility for the bits to be modified if any of the systems concerned are compromised. You can encrypt, which offers security once it’s done, but something still has to do the encryption and something else has to decrypt at the other end, and either of those could potentially be compromised. Plus encryption typically relies on either a key exchange or a reliable certifying third party, both of which open up other attack vectors. There are security risks even with hand counting (one or more of the counters could be corrupt or acting in bad faith) but it’s extremely difficult to scale any attack, and recounts can generally catch any wrongdoing in any scenario short of large scale corruption. Neither is true of electronic attack vectors (in cases where there is no paper ballot, it’s not clear what a recount even means). > You can’t. As soon as bits get involved then there is the possibility for the bits to be modified if any of the systems concerned are compromised. Oregon, at least my county, uses hand-vote/electronically counted ballots, audited and then kept for 5 years (IIRC). The mail-in system means that all ballots go to the county elections office; from there someone sends the count to the Sec. of State office – probably on paper, for the official count. There is an error rate in the electronic counting, but I don’t know what it is. My county, relatively affluent, goes to considerable lengths to count all possible ballots – they’ll call you if your ballot has a problem. I’m pretty confident in the Oregon vote, but this isn’t Florida, or even California. We did have one case of cheating at the elections office, a county near Portland: a Republican elections official was filling in unvoted positions – for the Republican, of course. She got caught, went to jail. The way to prevent this would be to have a “not voting this position” bubble for each slot. My chief concern with our system is that it would be possible, in small counties where everyone knows everyone else’s business, for an official to discard ballots from people they disapprove of, since the names and signatures are on the outside – separated from the ballot before any counting. So that could be another glitch. There’s no such thing as a foolproof system. There was plenty of cheating when all ballots were hand marked and hand counted; dead people used to vote then. Much depends on administration and enforcement. We love the mail ballot system. Allows voting at leisure, if you don’t leave it till the last minute, like we just did. There’s an odd camaraderie among those dropping off their ballots at the last minute. And Oregon provides the Voters Pamphlet, which is loaded with information. Netflix say the former US President and First Lady have “entered into a multi-year agreement” with the service. “Barack and I have always believed in the power of storytelling to inspire us,” said Michelle Obama. Exact details of programming have yet to be announced. Obamas to make TV and films for Netflix, Radio NZ (22 May 2018). Fooled them once in getting the votes. Fool them again by getting them to watch that. I love reading and discussing that story every year with second graders. It advances my cause of turning them into skeptics, and sows tiny seeds of anarchy. Which sprout just in time for third grade! Is that “the same old okey-doke”? As in my part of my town, where said arterial is the one and only through route – except the railroad, a couple of blocks away. Which might be one reason so many people walk on the railroad. The solution to protecting pedestrians here is a series of crossings with dividers and blinking yellow lights controlled by a button. People use those a lot. Proviso: the town mostly has good drivers and good traffic enforcement. People do respect those yellow lights. Don’t know about cities with more scofflaw cultures. Wow! Whats that about stuff floating? You know the phrase. Penn is definitely a floater. Given the various Monday Morning QB takes on the 2016 election, I would have thought this doofus’s loss to Obama in 2008 would get more play at least when explaining how HRC had already blown a lay up election and not by very much, mostly not knowing how the rules. But 3 were Irish, greatly increasing the odds. It’s the Italian that’s surprising. Ethnicity does matter when it comes to genetics. We were exposed to this when our son had a bone marrow transplant. He happened to have a family donor (me – quite unusual); but those who didn’t were in trouble if they came from an unusual background. One mother was starting a Latin American registry, since they were drastically underrepresented on the existing ones. And we heard of a family friend who, IIRC, was out of luck because he came from such an unusual cross. If you’re inclined to see resemblances, they’re everywhere. But sometimes they disappear abruptly when you see the people together, as happened yesterday at the store. Very impressive resemblance, but they show only one of the matches. She’s “black Irish,” improving the odds on the Italian. re Kali Akuno (under “Realignment and Legitimacy”), some good interviews with him at Black Agenda Radio, below for example. Also, he’ll be one of the speakers at Left Forum in NYC first weekend in June, which I’m going to for the first time…has anyone ever attended past forums? Tricia, please let us know what you think of the conference (never heard of it) and particularly of Akuno. He edited and wrote most of “Jackson Rising: The Struggle for Economic Democracy,” about building cooperative economy in Jackson, MS. I’m impressed with the quality of his thinking, and that project is something to keep an eye on. Well put, and directing the gaze toward the social conditions we’d like to try, and away from a morbid overfocus on the system that is decaying all around us. Okay, that is just how I am reading it, possibly not at all what Akuno meant. I also don’t like the phrase “morbid overfocus” but not sure how else to describe our inability to escape the context of markets. “The author bio caught my attention: “Hi, I’m Neal. I’m a product lead at Google and a serial adventurer…” — I suppose spoiling all the ensuing autohagiographical information-dumping, a kind of adult Type A version of the laundry list of “fabulous extracurriculars” which is now de riguer among college applicants, with “…and I work for one of the most profoundly evil entities in all of human history” would be kind of a downer, eh? I wouldn’t count “Spying on billions of people’s boring online lives” an adventure. Maybe a serial if you count it as being repetitive. I watched the entire “Harry and Meghan” Royal Marriage, having only intended to watch a bit of it. Two Billion people joined with me. I had loved the People’s Princess, Diana. Now, the creepy English Monarchy is being re-formed by her two boys, William and Harry. Diana would be so proud. This wedding was a celebration of simple, unsullied Christianity- the Big Tent that calls EVERYBODY in. In just one week, Kanye West and Candace Owens changed the USA political map. The Wedding of Harry and Meghan will also. What a powerful narrative! In our innocence, we are drawn to Prince and Princes Fairy Stories. They light-up timeless, archetypal pathways forward, during these uncertain times. Ordinary human beings (like Meghan and Harry) make unbreakable vows, before God. How can we not talk about this wedding? The Royals are figureheads for a class of people who we from the cheap seats feel ourselves to be in existential conflict with. That said, we can sympathize with the individuals, but not with the class. To the extent that a public private event, such as this wedding, is a display of wealth, ostentation, and general class privilege, it stands as an example of the unnecessary divisions within the society. It highlights the inequality. We too refuse to watch much television. Not only because of the depraved nature of so much therein, but also because of the low standards exhibeted in the scripting and production values. Good drama teaches the viewer something, or at least tries to do so. When the reason for a program is excess, then we descend into Grand Guignol and burlesque. I’ve ‘shot myself in the foot’ here too many times to count, but, with this d—-d tooth teaching me a new appreciation for pain, I’m in no mood to be happy about anyone elses’ wedding today. That was exactly my point! The leadership of the Monarchy has shifted to William and Kate and Harry and Meghan. They all seem to me to be thoroughly decent people. “If only we could get good people in office, corruption would end” is Third World-style politics, IMNSHO. Here’s some “bah, humbug” on the Royal Wedding. Interest in the wedding seems harmless enough–a kind of reality TV show–but then I didn’t watch it. I do disagree that there’s nothing good on television these days and will just cite shows like Breaking Bad and Better Call Saul or Game of Thrones. PBS plays some good stuff. Can’t speak to US network television as even I rarely watch that. We hesitated watching Breaking Bad when it was in prime-time, as it was full of meth-odd actors, and anything methy is usually a downer, man. And then we found religion and binge watched it, eager for the next stanza in the lives of sedulous meth makers, and circumstances ensued. The best tv series ever. This may be ignorance, not prejudice. I had to buy some dress shirts from a bourgeois retailer because my arm / neck combo isn’t close enough to three-sizes-fits-all and they keep sending me catalogs. In 2018 the men fashion models are all unshaven. I haven’t been counting but my estimate is N = ~ 50 and every single one has 3 – 5 days of stubble on their faces. Clean-shaven is now close to if not downright deplorable. Being a greybeard, who shaves irregularly, I’ll say that it blows our minds too. Why, just last month I had a head full of auburn locks. I swear it! That was the coolest thing in a feline-y video i’ve ever seen. Of all the various types of varieties @ Cat Haven in Dunlap, Ca., I was smitten with the Canadian Lynx, as seen in the amazing wailing and approach of the duo of film fame, who didn’t seem to care that humans weren’t that far away. Do check out their website and all of the different felines on site, really an amazing place worthy of a visit if you’re headed to Grant Grove or Cedar Grove on Hwy 180. When the Rough Fire was raging on it’s way to consuming 151,000 acres in 2015, a good many of the cats had to be evacuated, as fuego loomed large nearby. What an undertaking that would have been, I mean where do you put a Barbary Lion? Hey guess what? The Supreme Court has okay’d an arbitration requirement by employers as a condition of employment. Well, that should solve all the problems in the gig economy, for starters. Well played, Justice Gorsuch. Vlad on How to Opt Out of Airport Face Scanning: Don’t FlyGuy Fawkes mask?